The Pride Of Essex award recognises individuals and businesses which actively and proudly promote the excellent local produce Essex has to offer residents within the county and further afield. 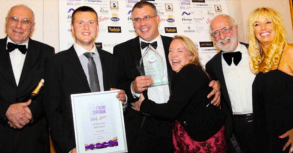 The Kings Oak Hotel was the sponsor of this award and Linzi Pollard MD of The Kings Oak was there to present the award to the winners Wibblers Brewery. Judges said: The winner of a Pride of Essex Award category is a business that has grown from small beginnings into something that has real potential for the future. They started off minimally, in fact almost as a hobby, but were encouraged to take it further until it became a full-time business. They use locally sourced raw ingredients wherever possible and recycle some of their waste products as animal feed for a local farm. Their products can be found in local shops across the county as well as other more specialist outlets, and they produce a wide variety of their staple product. Such has been their success that they are now looking to relocate to a bigger and better unit. All of our entrants met the criteria for this award, which made judging difficult, but this business seemed to go just that extra mile to be the Pride of Essex. They are that business with the somewhat strange but appropriate name, Wibblers Brewery. Linzi Pollard’s own business, the Kings Oak Hotel, located at High Beach in the heart of Epping Forest also came from humble beginnings when in 2009, she took over the failing company who was running it. Having invested quite a significant amount of capital and used her considerable experience in the hospitality industry, her management style and sheer hard graft has finally turned the Kings Oak business around, where today it is a premier wedding and Essex party event venue.